The LT was the main subject of the latest "Sky at Night" TV programme last week. 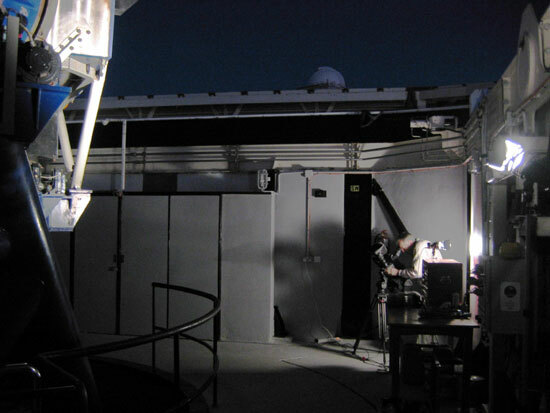 Professor Mike Bode gave the audience a basic run-through of how the LT came to be and what it means to have a fully robotic telescope at your disposal. The show aired on Monday the 6th of September, and will be repeated on Saturday 11th September at 12:15pm on BBC2. You can watch the show streamed over the web from the BBC's "Science & Nature" website, by following this link. It's in RealAudio format, so you'll need RealPlayer installed on your machine to view it. Filming the show was a lot of fun, and here are a few photos taken behind the scenes (click thumbnails for bigger images). BBC cameraman filming the LT in evening twilight. 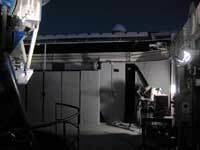 It took about half an hour, and was before any of the other telescopes started observing for the night, so the camera lights didn't disturb them. Mike gets enthusiastic about the telescope during filming in the computer room of the observatory. The sound engineer did a good job of filtering out the din from the rack-mounted computers. 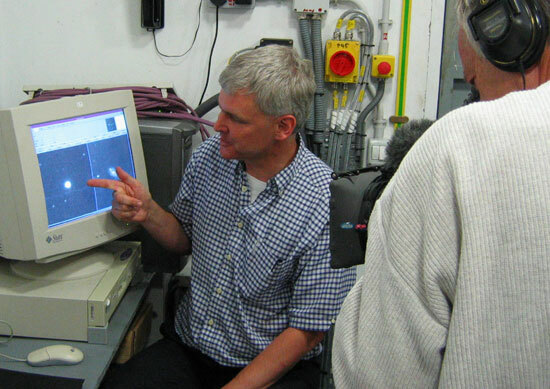 Mike points at an image of a nova we snapped manually after receiving an alert from an IAU Circular. On the right of the screen is a supernova confirmation image we took after receiving an alert from amateur Tom Boles. 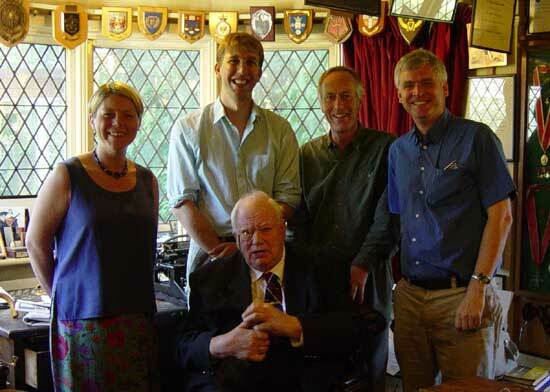 In Patrick Moore's house after completing voice-overs and links for the show: (L-R) Jane Segar, Chris Lintott, Patrick Moore, David Evans, and Mike Bode.